One of the reasons why many wannabe muscle-builders avoid soy protein is because of a belief that soy will increase estrogen and reduce testosterone levels, slowing down muscle growth. A meta analysis published in a 2010 edition of the journal of "Fertility and Sterility," however, concluded that neither soy-based foods nor supplements have a negative impact on testosterone levels. When compared to whey and casein protein supplements, soy protein powder sits somewhere in the middle in terms of muscle protein synthesis. This is the speed at which protein is used by the muscles, and a higher protein synthesis is beneficial for building muscle. 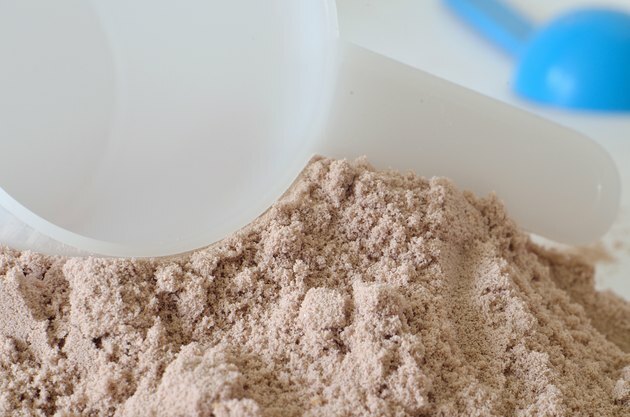 In a study from a 2009 edition of the "Journal of Applied Physiology," soy protein supplementation was inferior to whey hydrolysate in terms of synthesizing protein for muscle, but it performed better than casein protein. Soy is the best form of nonanimal protein, according to Dr. Jose Antonio, head of the International Society of Sports Nutrition. One of the reasons for this is that soy is a complete protein. Most plant-based proteins are what's known as incomplete proteins, meaning they don't contain all the essential amino acids, whereas animal proteins do. This makes soy a superior muscle-builder to other plant-based proteins, as you don't need to combine it with another protein source to make sure you get all the amino acids. Soy protein can come from different foods, such as soy milk, tofu and edamame, as well as special soy protein powders. Vegan strength athletes and bodybuilders often consume a lot of soy-based foods, notes nutritionist Ryan Andrews, which is fine, but when picking a supplement, you may want to look to a plant-based protein powder not made from soy, to avoid overloading on a single source. Brown rice, hemp and pea protein are all other options. Columbia Health Go Ask Alice! : Complete and Incomplete Proteins in Grains and Vegetables?